JBRND crafts innovative pocket doors, with manual, electric, offset swing and offset folding options. The mounting structure is machined from lightweight aluminum. A location template is provided and the door is shipped whole for quick installation. Our aircraft pocket door solutions are custom built for any aircraft, in all types of configurations. Our electric doors have a load capacity of 100 lbs, while our manual doors have a load capacity of 25 lbs. Electric aircraft pocket doors come with our custom capacitive touch switch option, (with standard or illuminated arrows.) Voltage options are 28VDC or 110VAC 400Hz to 800Hz. Our standard pocket door sizes are 28″, 30″ and 36” with custom sizes available. Contact JBRND today to find out more about our aircraft doors. 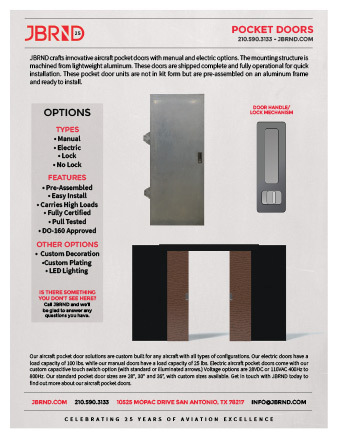 Get the JBRND brochure for our pocket doors. The brochure is one page, in PDF format, ready for printing. If you are interested in any other JBRND brochures, make sure to visit our Downloads Section, where there are many others available. As always, just get in touch if you have questions.